The history of the Woodridge Public Library goes back almost as far as the Village itself. In 1961 (two years after Woodridge was incorporated) Village President William T. Roberts requested a library committee be organized by Mrs. Bruce Lentz. 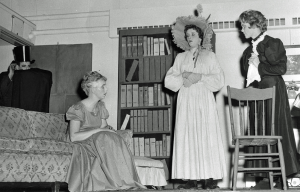 In addition to accepting donations, the Committee also raised funds by putting on an old-time melodrama entitled The Curse of the Aching Heart (pictured at left). The play starred Barbara Blecher, Bill Miller, Al Zettler, Faye Hoffman, Barbara Cooling and JoAnn Baaske. Books were also collected by village residents to be donated to a Library. In 1965 the newly formed Woodridge Woman’s Club petitioned the Village Board to be appointed as the group to be responsible for opening a library to the public. The Village Board agreed, and the all-volunteer Woodridge Village Library opened to residents September 17, 1966, in the lower level of what was then the Village Hall. Woman’s Club members volunteered their time to check books out and provide reading times for children—all done during the 6 hours a week the Library was open. Village President Roberts again took the initiative and asked the Woman’s Club to begin preparing for a possible referendum to create a village library that would operate under official Illinois statutes. 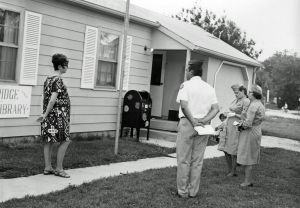 On April 18, 1967, Woodridge residents went to the polls and voted overwhelmingly to establish a public library supported by a tax rate of 12 cents per $100 of assessed valuation. The vote was 137 Yes, 73 No. Elected to the Library’s first Board were Hester Thuerk, who became President; Helen Zettler, Secretary; Jeff Hunnicutt, Director of Finance; Phillip Muehleck, Chairman of the Building Committee; Roman Lins, Director of Policy; and Florence McCarthy, Director of Public Relations. The Library’s first Board meeting was held in May, 1967. It was already a member of Suburban Library System (later to become Metropolitan Library System). In January, 1969, the Board purchased a house with less than 1000 square feet at 2916 Forest Glen Parkway in which to house the Library. Used library equipment was purchased, and in March, 1969, Laurie Kagann was hired as the first professional librarian and as Head Librarian. Myra Mahlke, who went on to serve 40 years as a Library Trustee, was first elected to the Board in April, 1969. With the exception of two years (5/77 - 4/79), Ms. Mahlke served as Board President until her death in August, 2010. Mr. Jay Tiede was elected to serve as President in 2010 and continues in this capacity today. June 14, 1969, the Library (pictured at right) had its official opening with a collection of 553 books. By September 20, 1969, when the Grand Opening of the Library took place, there were two additional employees. The Library was open Monday and Thursday, 12 p.m. to 5 p.m., Tuesday and Friday 10 a.m. to 5 p.m., and Saturday 9 a.m. to 4 p.m. No circulation statistics exist for the first year, but the second year the Library circulated 700 items. The third year circulation increased to 18,398 items in spite of the limited number of hours. In September, 1970, the originally elected Board President, Hester Thuerk, resigned to move out of Woodridge, and Ms. Mahlke was unanimously elected to replace her. Ms. Mahlke continued to serve as Board President until her death in August, 2010. By 1971 the Library was outgrowing its space, and on June 5, 1972, a new building was opened at 2815 W. 75th Street. Carol Iffland, the first Children’s Librarian, was hired in September of that same year. Woodridge kept growing, and so did the Library. In April, 1977, voters approved a referendum to sell bonds for a new building (1590 Yes, 1545 No). The architect for the new Library, which had the address of 2525 Center Drive, was William Baldwin & Associates. It was dedicated October 7, 1979. Over the next 15 years, the Library experienced many changes. Mrs. Kagann resigned in 1986, and Ms. Mary Sue Brown became the new Library Administrator. Library hours increased, eventually extending to 72 hours per week, including Friday evenings and Sunday afternoons. The collection grew to 100,000 volumes. Circulation increased to 400,000 per year. New formats were added in the way of videocassettes, books on cassette, and music CDs. Seating for library users diminished as shelves were added for the growing collections. The Board of Trustees recognized the need for additional space and contracted with the library building consultant Anders Dahlgren to develop a building program statement. Completed in the fall of 1992, the Building Program Statement recommended 51,000 sq. feet to house the projected collection of 175,000 books and 17,000 audiovisual items to serve a projected jurisdictional population of 39,000. Another building referendum took place in April, 1995 (1206 Yes, 911 No), and the voters approved $5.7 million in bonds for expansion and renovation. The architectural firm of Carow Architects and Planners designed the addition and renovation. The project was completed in September, 1997. In July, 2004, Suburban Library System merged with the Chicago Multitype Library System and took the name of Metropolitan Library System, still headquartered in Burr Ridge. State finances in late 2009 and 2010 caused the Illinois State Library to require even more stringent merging, and in July, 2011, Metropolitan Library System merged with four other library systems in northern Illinois to become Reach Across Illinois Library System (RAILS). The Library continues to add new services and formats. E-books, downloadable books, several kinds of e-readers (Nooks, Kindles, NookTablets), reference databases available 24/7, DVDs (including Blu-Ray), wifi access, audiobooks on CD, and electronic game tournaments for young adults are just some of the most recent service additions. A Spanish language collection serves the village’s largest growing population group (based on the 2000 and 2010 Federal censuses.) In 2001, the Library’s circulation reached 500,000, and in the fiscal year ending April, 2012, over 675,000 items were circulated. Over 500,000 people come in the Library's doors every year. Ms. Brown retired in June, 2007. She was replaced by Ms. Susan Roberts, who passed away very shortly after taking the position. Ms. Susan McNeil-Marshall became Library Administrator in December, 2007 and retired in March, 2016. Pam Dubé became Library Director in May, 2016. The staff now numbers 62.